Halloween has always been one of my favorite holidays and for me it usually is the kick off to some of the best times of the year, Thanksgiving and Christmas. Every year we go to a Halloween party hosted by some friends of ours. Last year we dressed up as pregnant Ariel and Eric, I wore a black skeleton shirt that showed a baby mermaid skeleton in my belly. I kind of got lazy this year, but I also thought it was kind of creative; we dressed the same but this year we included Georgia as our mer-baby! I loved how our costumes turned out and luckily they took minimal effort on our part which is what I am all about right now. Georgia was a hit as usual & was in a great and happy mood for the party. 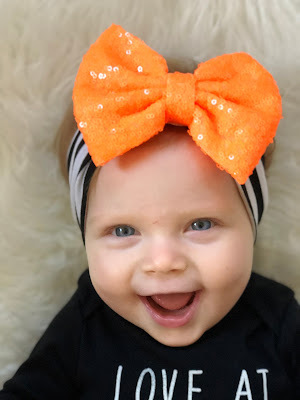 I custom ordered her onesie for Etsy and also got her bow from an Etsy shop. I love that both the onesie and the bow can be worn again, not necessarily just as a Halloween costume. I was so happy with how everything turned out given that I really didn't do much planning at all for these costumes. For myself, this year I got (also from Etsy) a sweatshirt that matched Georgia's onesie. It's funny how different we dress as adults & moms for Halloween. I had come across a picture of myself in 2007 very scantily dressed, definitely nothing you'd catch me in today, funny how that changes! Now I am all about being warm and comfortable. We decided trick or treating will wait until next year. We live out in the country and only have 1 neighbor so we don't get to pass out candy and don't really have anywhere close to home we can go. 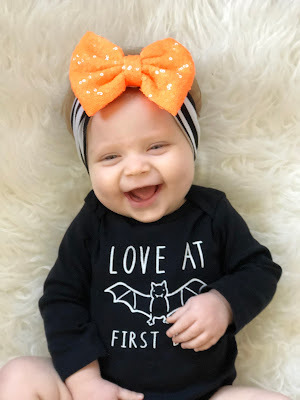 I do have her in this adorable Love at First Bite onesie & fun bow, but I think we will probably cozy up to the fire and a scary movie at home this year. Next year we will take her to town and probably drive around to grandparents and aunts and uncles houses, but I think this year we will pass. 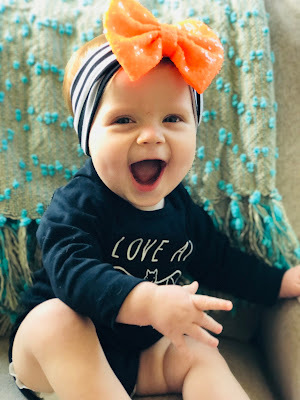 I definitely miss handing out candy, but I am so looking forward to being able to take Georgia to town so she can trick or treat when she gets older. Before we know it Thanksgiving will be here followed by Christmas! We have family pictures coming up in a couple weeks and I cannot wait. I've got outfits coordinated and we are definitely due for some new family photos. The holidays are always busy for us as we run around to try to make an appearance at all of the different parties and gatherings. This year will definitely be hard with Joe's dad being gone, one of our favorite Christmas Eve traditions will certainly never be the same without him, but I know that this will also be an extra special holiday season for us as well as we finally get to experience them with our baby girl in tow. Holidays in the past have always been extra tough, we are all too familiar with the pain that comes along with having empty arms during the holiday season. As always, I just want to remind you that if you're still in the wait, if you're still struggling, if you're still on your pursuit, don't give up. Don't let this time of year get you down, use it as fuel for your fire, let it motivate you, let it help you keep that determination you have. We sat in wonder for 5 Christmases, then last year, we finally had our miracle on the way. This year we get to enjoy the fruits of our labor as we experience our first Christmas as parents. That being said, I will never forget how hard these upcoming months can be when suffering through infertility. You are not alone & we are all here for each other as a community even more so during these times. She is just so stinking cute and I love the concept! I love Georgia's outfit! I sooo got lazy this year. Totally half assed Rory's mermaid costume and ended up just getting Jesse and I shirts that say "Mermom" and "Merdad". And I'm definitely not looking forward to it being cold tonight which means that Rory won't be able to show her costume off as much. Being pregnant again and in the process of getting ready to buy another house and move was just too much for us to go all out for Halloween. Hoping next year I am a little more motivated and have more energy! So cute!! Of course she is cute in everything you put her in :) I totally agree with ya on staying in for Halloween. Although Bowen is right at 2 he still doesn't totally get it. He wouldn't wear his costume to the church trunk or treat but that's ok. I am sure next year he will understand it better. Love love love that you got to add a new-baby this year!